Log Agent reads files data from remote data sources and ingests the data into Kafka or RabbitMQ channels. Log Agent is installed on a remote machine and has three java processes running internally, LogAgent, LogThread, and Main. LogAgent process reads system logs, whereas LogThread and Main processes read all other types of logs. Extract StreamAnalytix bundle, and configure agent.yaml file located at /StreamAnalytix/conf/yaml. Extract logstash tar located at /StreamAnalytix/lib folder, and configure property logstash.bin.script.location in agent.yaml file. Note: Install command is required only for the first time when Log Agent is to be installed, after that you need to run only start command. 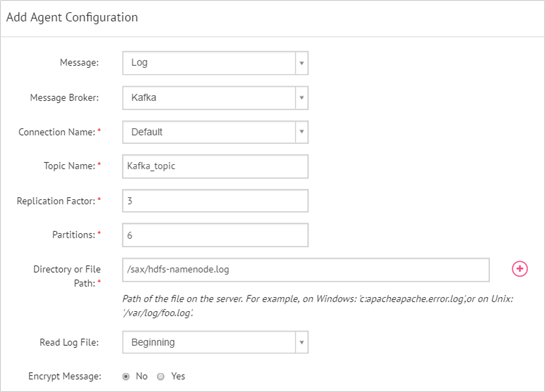 On the Agent Configuration page, select message broker as Kafka and provide the path from where to read log files to configure a log agent. 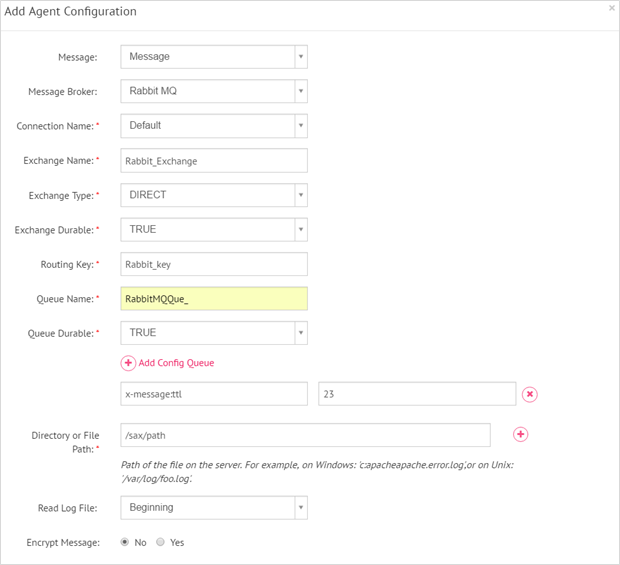 On the Agent Configuration page, select message broker as RabbitMQ and provide the path from where to read log files to configure a log agent. Message Name of the message to be used in the pipeline. Message Broker Select Message Broker as RabbitMQ. Connection Name Select a connection for the message broker. Exchange Name Is the Exchange Name where data is pushed. Exchange Type Type of exchange where data is pushed. Exchange Durable If RabbitMQ is selected as broker, and if this property is set to True then the exchange will not be deleted if you restart RabbitMQ . Routing Key Routing key helps in routing specific data to specific queue based on binding using this key. Queue Name Name of the queue where data is stored. Add Config Queue Additional RabbitMQ properties can be configured using Add Config Queue.